These larvae, which are not usually attended by ants, seem to prefer several species in the family Acanthaceae, such as Hygrophila angustifolia and Ruellia tuberosa, but they have also been observed on the legume Desmodium scorpiurus (Fabaceae). They feed initially on the flowers and then on the young fruits. Mature larvae 7 mm long, body colour tends to match the host food, usually pale green with a conspicuous dark red line as well as some other markings: head pale yellow brown. 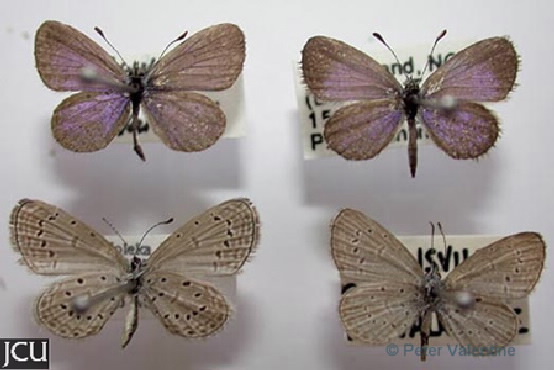 Adult male lilac, outer margin a broad brown band, narrow on hind wing; female dull brown may have a bluish tinge; lower surface pale green with some rings and small brown-black spots.